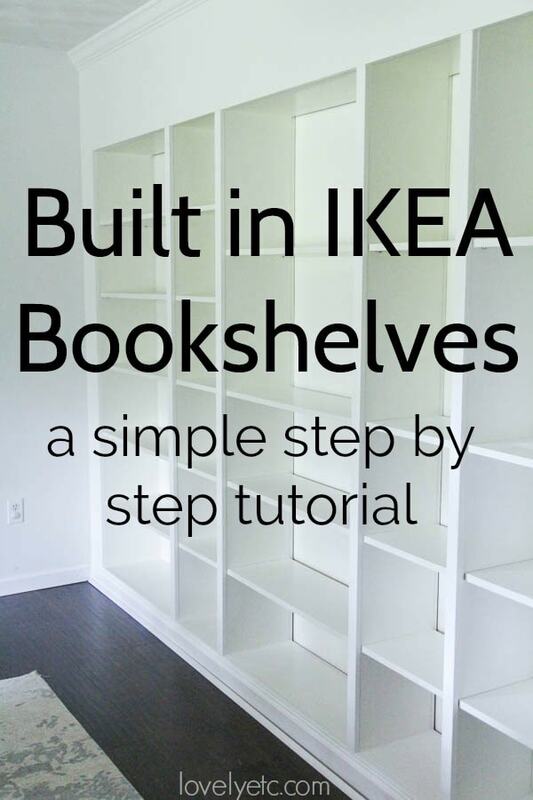 How to Build Easy Built Ins from IKEA Bookcases - Lovely Etc. These Ikea built ins have been been a long time coming. 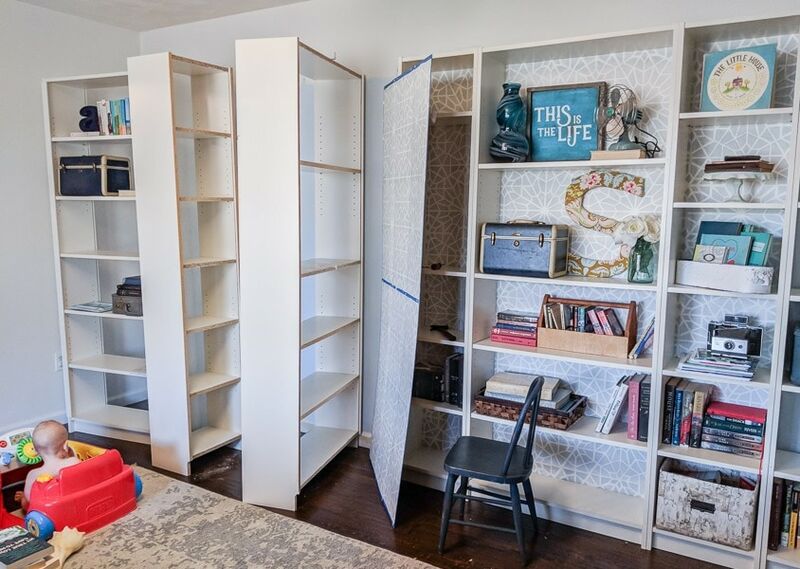 Even though the majority of the structure comes from tall IKEA Billy bookcases, you would never guess these built ins were actually inexpensive laminate furniture. 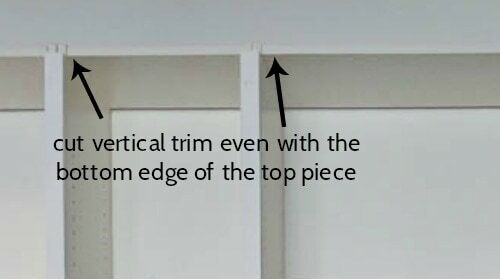 All of the little details that make flat pack furniture look cheap have been removed or covered up including those cheap cardboard backs, the millions of holes for shelf pins, and the ugly toe kick at the bottom. 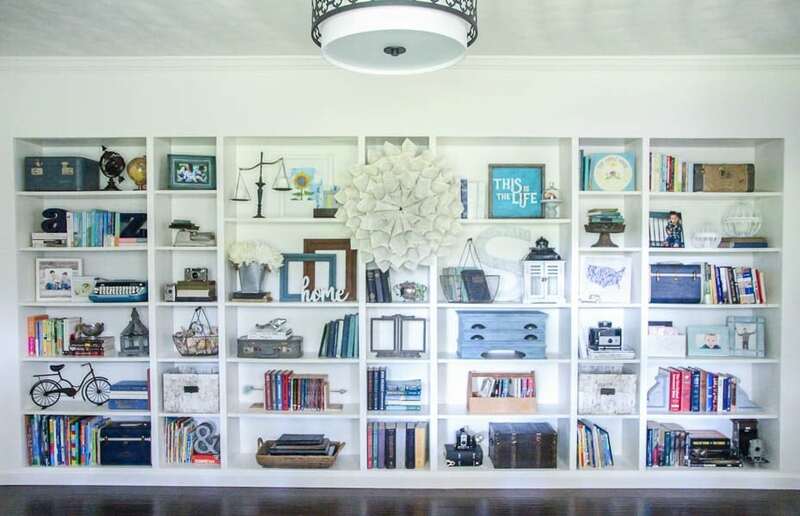 This whole project started way back in 2012 when I decided I wanted a wall of built in bookcases in our living room to add style and storage. Huge built-in bookcases are incredibly expensive, so I decided to save money by using IKEA Billy bookcases and just adding molding to make them look built in. So I headed off to IKEA, bought a huge pile of IKEA Billys, brought them home and assembled them. The problem was I never quite managed to turn them into the built ins of my dreams. 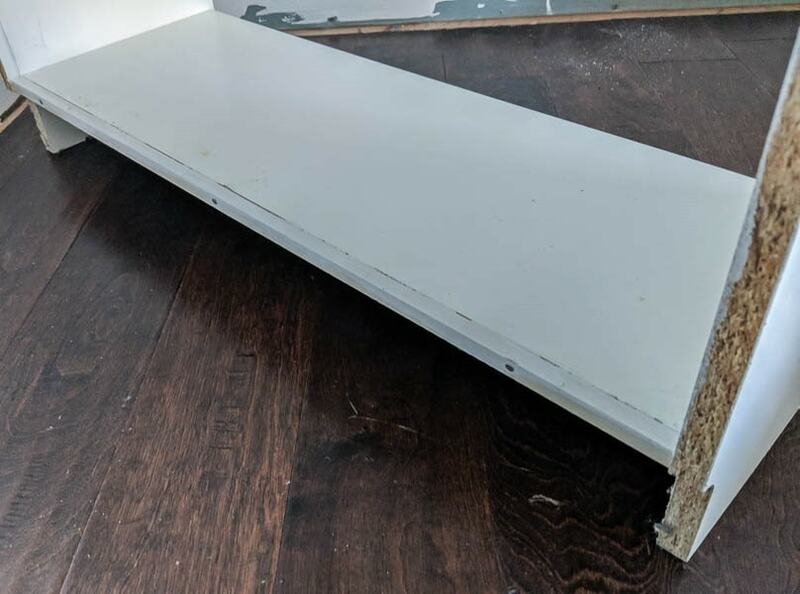 I read a bunch of blog posts about making IKEA bookcases look built in, but most of them sadly weren’t as helpful as I had hoped. They were full of beautiful photos of the end result and then said something like “My husband/father-in-law/dad/neighbor installed them so I can’t give a step-by-step tutorial but it isn’t that hard.” Not terribly helpful for those of us without a handy relative to make our built-in dreams come true! So back in 2012, I added some trim to connect all of my Billy bookcases together into one unit and hide the ugly toe kick and called it a day. I also painted the backs this royal blue color. A couple of years later, I was over the blue so I updated the bookcase backs with a stencil. It was a huge pain to do but I think it looked really pretty. When I installed hardwood floors in this room around that same time, I had to move the bookcases out of the way so I could install the new flooring under them. In order to move them, I had to take all of the trim off and never put it back on so they were back to being basic Billy bookcases with a pretty stenciled back. And they were fine. They really were. But they just weren’t what I had really wanted. 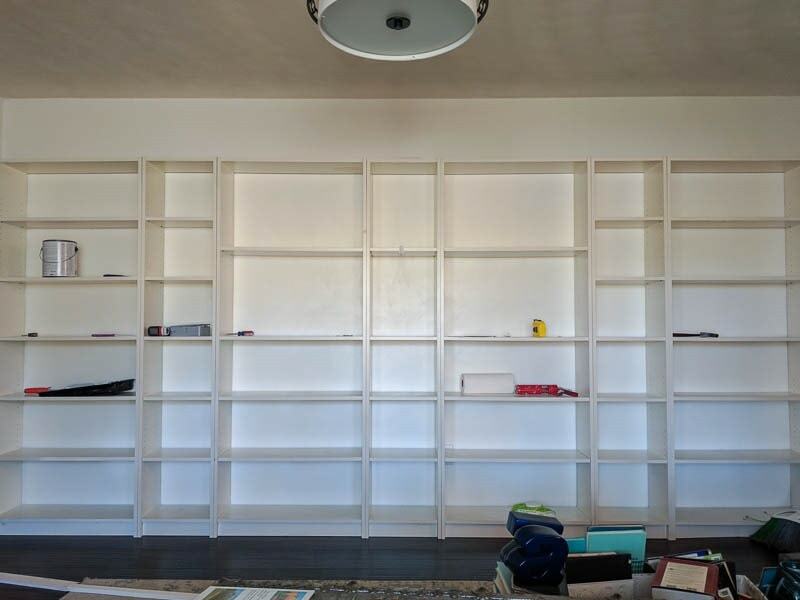 One day I was sitting on the couch looking at those bookcases and I decided it was high time I turn them into the built ins I had been dreaming about from the beginning. I may not be a professional cabinetmaker, but I’ve definitely improved my DIY skills over the years and even more importantly, I’m way more confident. Even though I didn’t know exactly what to do, I felt confident I could figure it out. So I got up off the couch and started ripping off those cardboard backs that very night. And then of course the next morning I wondered if I had just made a big mistake, tearing up part of our house without really having any idea what I was doing. Thankfully, it worked out beautifully in the end and I finally got my real grown up wall of built in bookcases. 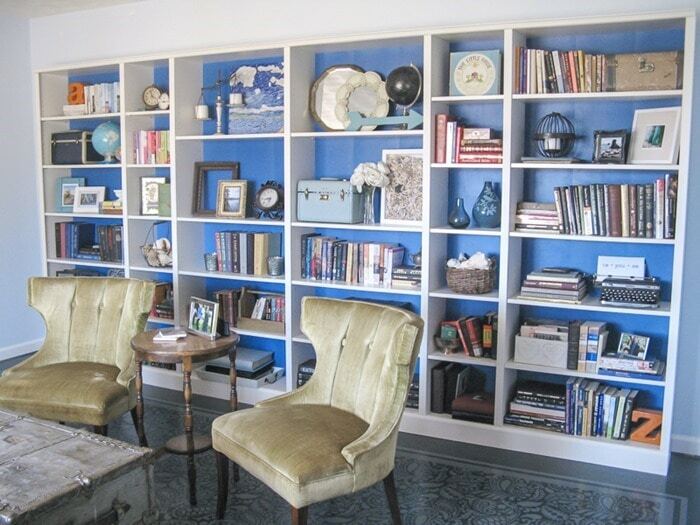 And the best part – you would absolutely never guess they were actually IKEA bookcases at heart! I want this tutorial to be actually helpful to others interested in creating their own Billy built ins, so I’m going to share as much detail as possible. I am not a professional carpenter by any means, but this method worked beautifully for me. If all you care about are some pretty pictures, feel free to scroll to the end. Also, my fellow Furniture Flippers are also sharing their latest furniture redos, so be sure to check those out below the tutorial as well. They always leave me feeling inspired! 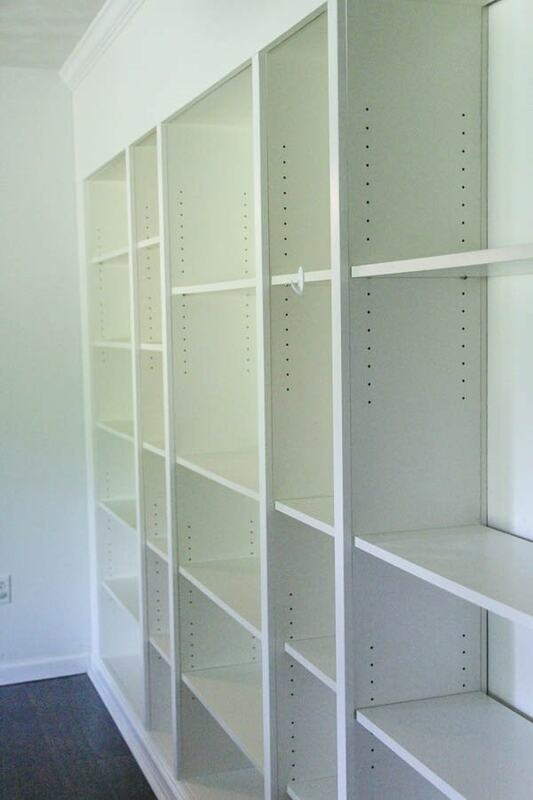 For my space, I used four 31 inch wide white Billy bookcases and three 15 3/4 inch wide white Billy bookcases. 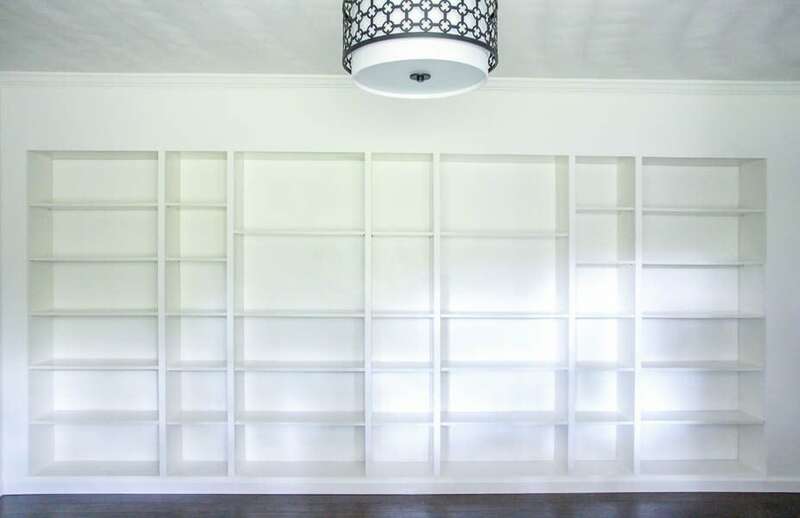 My bookcases are the standard 79” height and 11” depth but there are lots of options including bookcases that reach almost to the ceiling or are extra deep. 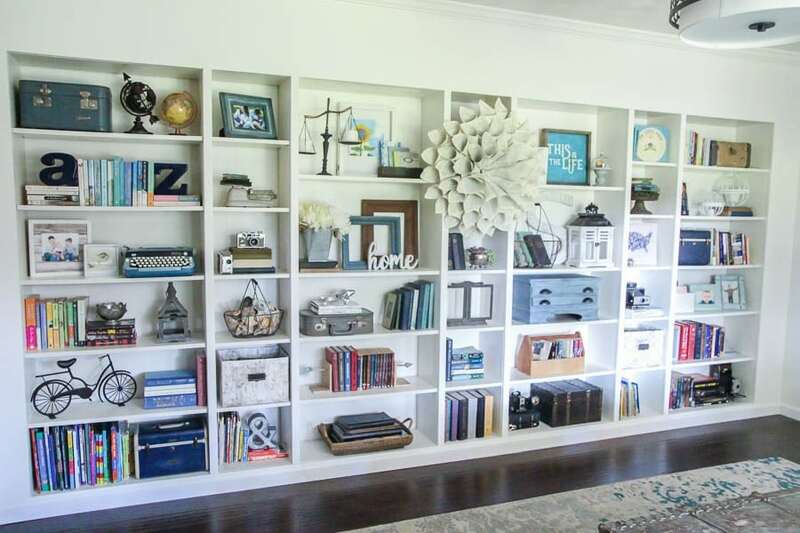 This same method will work with any configuration of multiple bookcases. 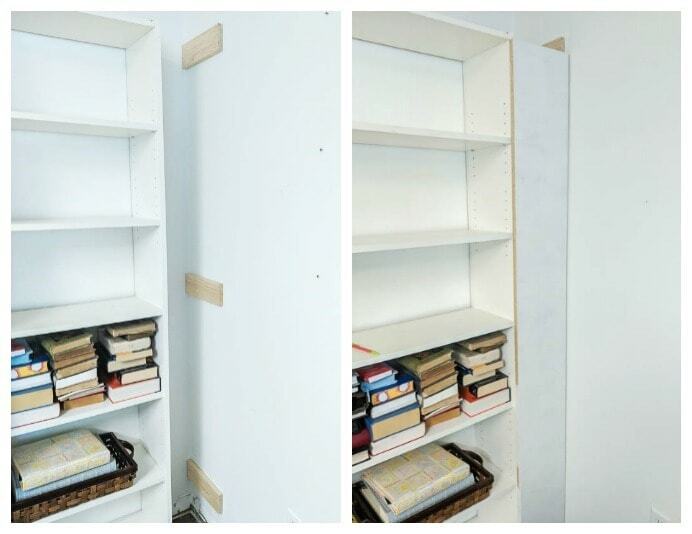 I chose to remove the backs from my bookcases and let the wall serve as the back instead. The back panel is basically glorified cardboard and it’s obvious. The stenciling I had done before went a long way in hiding the ugly fold marks on the backing, but I still thought they would look more like true custom built ins without it. There are also a couple of outlets along the wall where these shelves are and removing the backing allows them to still be accessible. Since I was taking apart previously assembled bookshelves, I used a hammer to pry off the backing and pulled out any stray tacks with needle-nose pliers. If you are working with brand new IKEA bookcases, you can simply skip the step where you add the backing. The downside of not using backing is it makes the bookcases much less stable, but we are adding plenty of trim and wood facing so these are still solid as a rock. I wouldn’t recommend using an IKEA billy bookcase without the back unless you are planning to reinforce the corners somehow. When the backing is removed, there is a groove along both sides that would have held the back in place. I filled this groove in with caulk. There is also a small gap at the back of the shelves where they meet the wall. I nailed a small 1/2 inch dowel to the back of the bottom shelves of each bookcase so that nothing could fall below and be lost forever. I also chose to remove the baseboards from the wall behind the bookcases. This wasn’t necessary but it made it a bit easier to fit the bookcases in place and I also wanted to reuse it on the front of the bookcases. Once the wall was painted, I moved the bookcases into position exactly where I wanted them to be. I chose to push all of my bookcases flush together with a bit of space on either end because this left all of my outlets accessible. 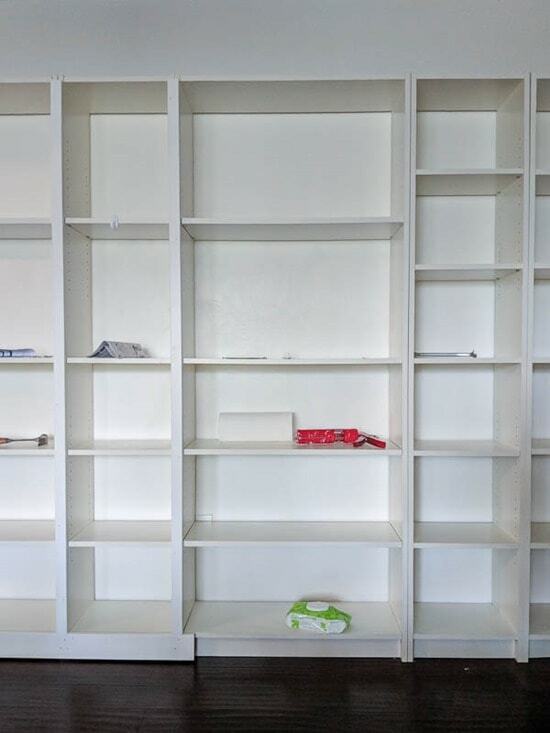 Another option is to space them out evenly throughout the space, leaving a small gap between each bookcase. Once you are happy with the placement, go ahead and secure them to the wall using the hardware that is included with the bookcases. 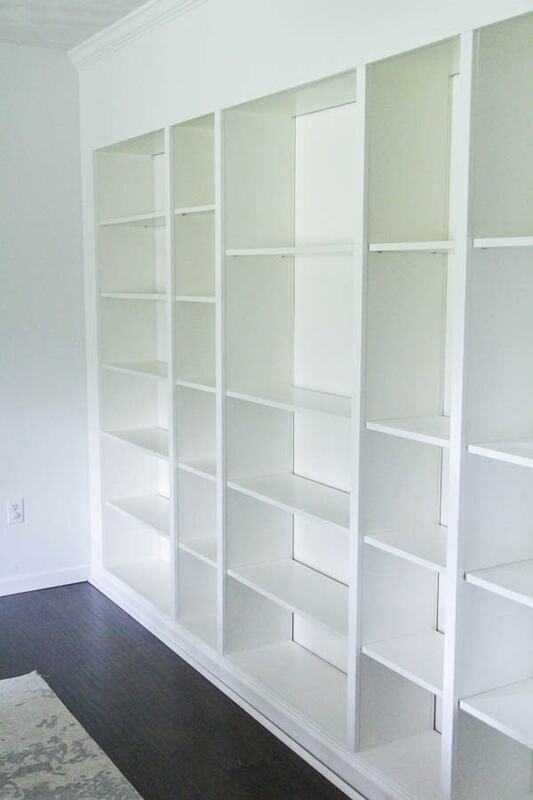 Next I attached all of my bookcases together along the bottom by nailing a 1×4″ board to the bottom shelf. This gives a nice flat surface to attach baseboards to later which really helps give the look of custom built ins. I also used basic 1×2” pine boards to attach each bookcase together vertically. A 1×2 happens to be a perfect match for the width of two bookcase sides pushed together. I cut each 1×2 to end right below the top edge of the bookcases. In the photo above that trim has already been added along the bottom and between each bookshelf in the left half of the photo. Just doing this makes the whole thing look so much nicer! Then it’s time to cover the open space between the ends of the bookcases and the walls to make this a true wall to wall built in. I measured the distance between the wall and the inner edge of the first bookcase in the row to find out the width of the board I would need. To find the height, I measured from the floor to the lower edge of the top of the bookcases. You can use a smooth high quality plywood or MDF for these sides. I chose to use MDF to save money and I also had them cut it for me in the store to save time. 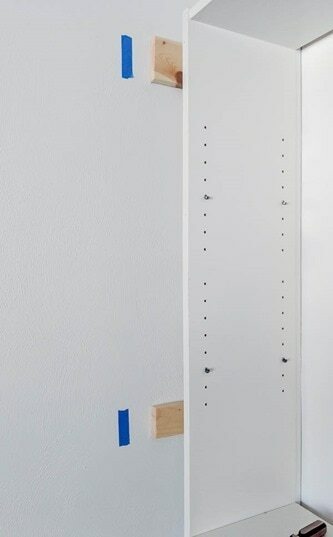 To attach these side boards, you need to add some wood supports to the wall. 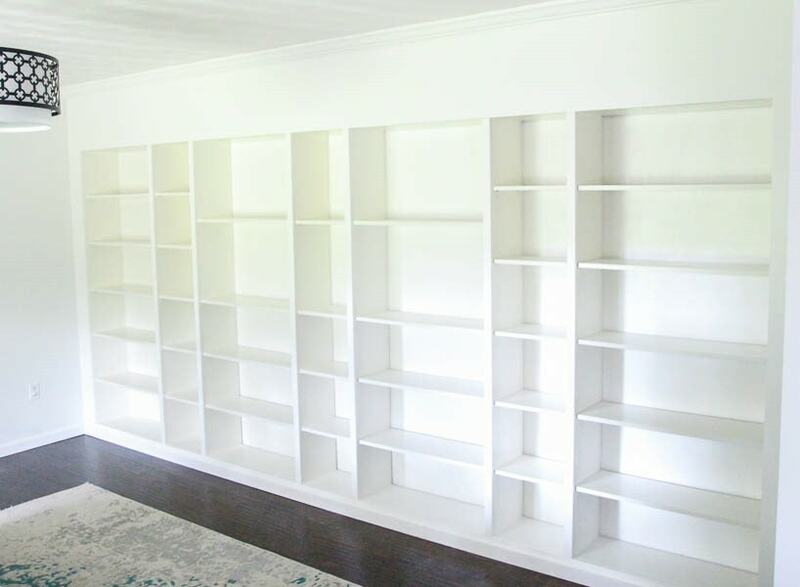 Measure the distance from the back wall to the front of your bookcase. You will need to cut three or four scrap boards to that length. Then nail them to the wall, nailing into a stud if possible. Now to fully enclose the bookcases, it’s time to enclose the open space between the bookcase and the ceiling. Measure the distance between the ceiling and the tops of your vertical supports. (These should be at the lower edge of the top of the bookcases.) Cut mdf or plywood to fit this area. 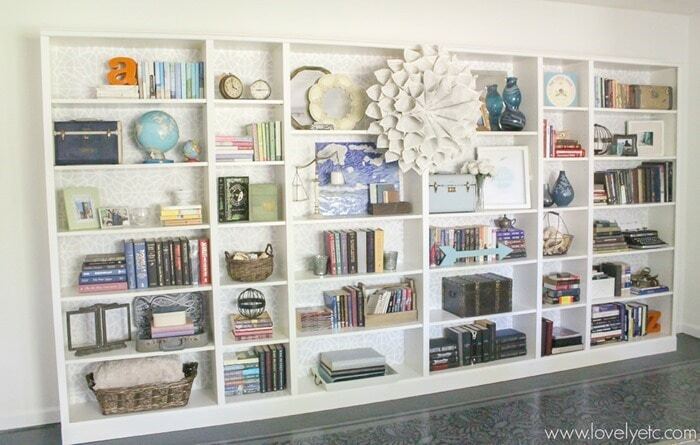 If you have a very long wall of bookcases like me, you may need to use a couple of pieces of wood for this. You will need to attach some wood boards to the ceiling for support, similar to how we did it along the sides. It would probably be a bit better to simply attach a couple of long boards along the ceiling instead of short pieces like I did, but mine is still quite secure. You want to be sure to attach these so they are even with the front of the bookcases and give a flat surface to attach the facing to. 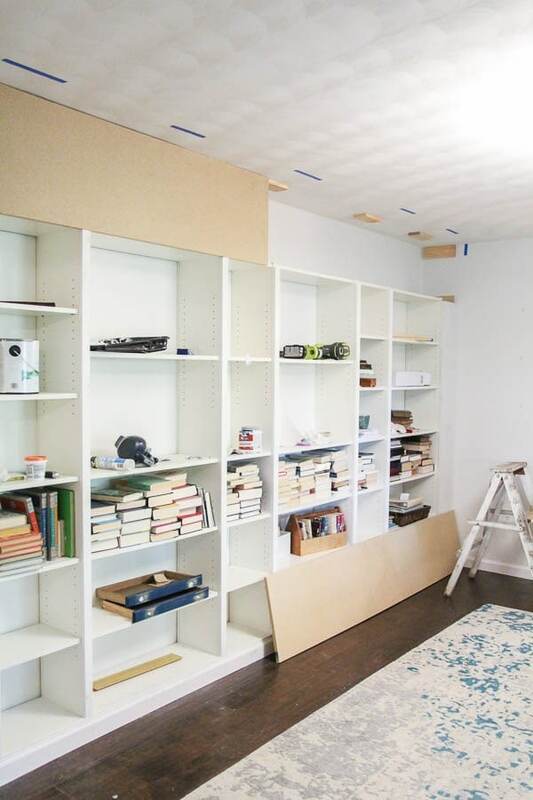 Your MDF or plywood will rest on top of the vertical supports and be nailed to the tops of the bookcases as well as the top to these wood pieces attached to the ceiling. Now you can add base molding along the bottom of the whole thing and crown molding along the top. At this point you are so, so close to finishing. Caulk all of the seams. Caulking can be a major pain, but it really gives such a beautiful finished feel. Luckily, white caulk matches the white IKEA bookcases well enough, it really doesn’t have to be painted over. Use a bit of wood filler to fill in any nail holes, sand them smooth, and paint everything your ‘IKEA white’ paint. Lastly, I decided on my shelf arrangement and filled all of the spare shelf holes with spackling. This is such a small thing but it made an enormous difference in making this whole thing look like beautiful custom built ins and not furniture that came out of a box. This does mean it won’t be as simple to move the shelves around in the future, but if I decide I really want to, it is easy enough to poke out the spackling with a screwdriver. Seriously, look what a difference it made! And now, finally, I have the built in bookshelves that I’ve been dreaming of. And I have to say I feel pretty darn proud of myself for doing this 100% on my own. Here they are all loaded up with books and other things I love. I’ll have to share more soon about my process for filling these babies up because it can definitely be a daunting task! 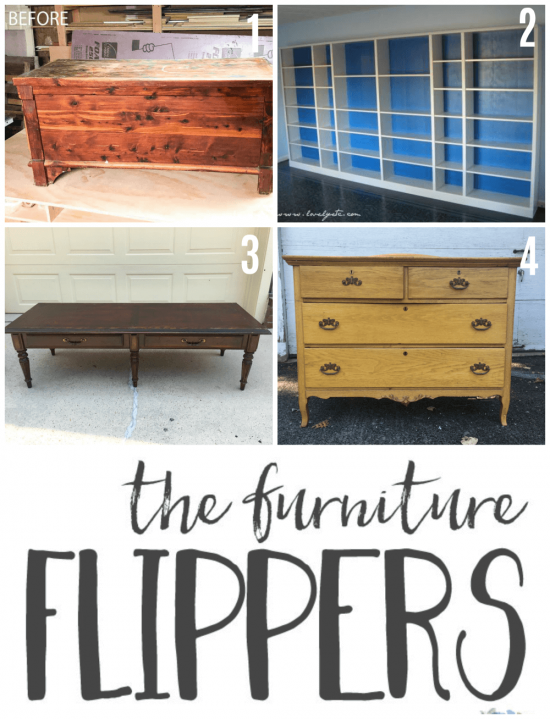 Ready to see some more fabulous furniture flips? Follow the links below to see what the rest of The Furniture Flippers have been up to lately. Wow! These look really amazing. I have always wanted a wall of built ins and yours look so good. Also, the tutorial was way helpful! These built ins look amazing! I’ve been thinking about doing this in our home so I’m definitely saving this for later. Thank you Lindsey! Good luck with your own! These look really great! My bookcases are just sitting in front of the wall begging to be placed neatly and firmly in place. Yours look like they are truly built in. I would love this look with added cabinets and drawers. I have often pondered putting cabinets and bookcases together for a built in look. This gives me the inspiration to look into that further. Thanks so much for sharing your project and for the details and pictures of the process along the way. So many times I see these before/after projects, but no in-between and quickly lose interest. Thank you Barbara! I love the idea of combining cabinets and bookcases for hidden storage. And I am glad my tutorial was helpful – this is the kind of thing where it really helps to see the process! Good luck with your bookcases. 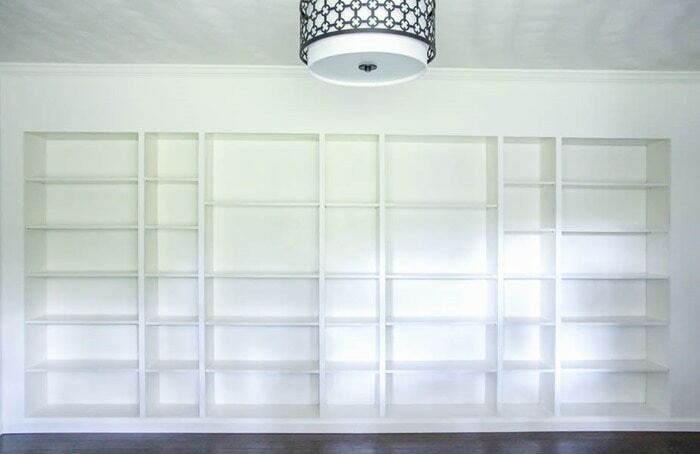 Carrie, your built in bookcases look incredible!!! You included so many helpful tips that really make these look like custom built ins. I look back at the projects I did in 2012 as well and can’t believe how much I’ve learned since then. Time to redo most of them! Carrie, these look amazing! (I’m glad I’m not the only one who tears things apart and then wonders if I’ve made a huge mistake!) I love seeing the progression these went through. 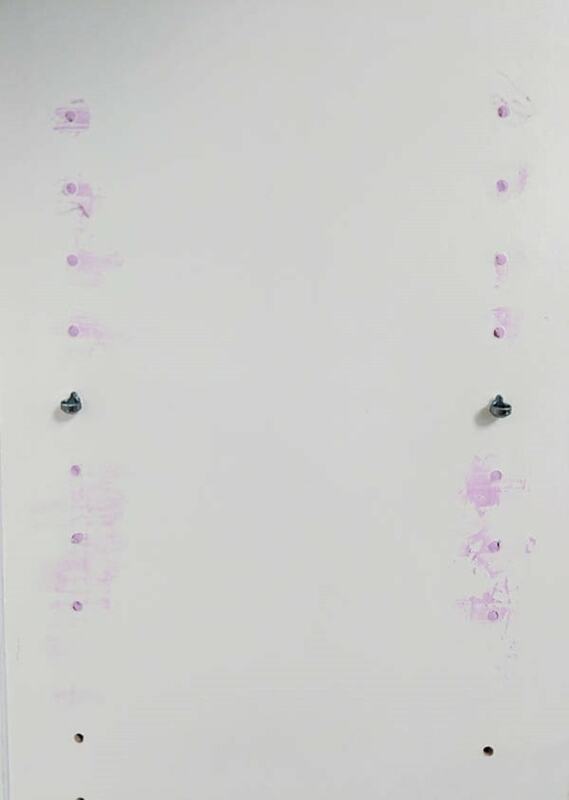 Maybe I missed it, but did you paint over the spackling after you filled the holes? I need to do that to my bookshelves too. I can’t believe what a difference it makes! Thanks Meredith! Good question – I did not paint over the spackling. Once it was dry, it was a close enough match to the white bookcases, it really isn’t noticeable. And I didn’t want to fool with painting the laminate bookcases unless I had to! What a great, instructional post! 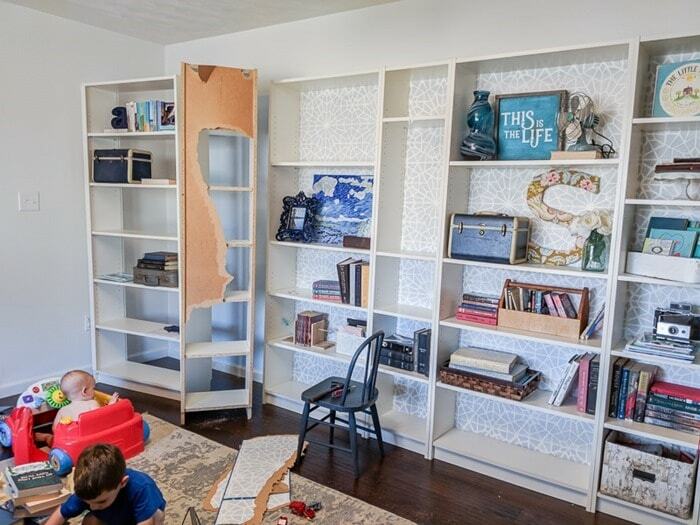 Thank you for sharing your built in bookcases with us. I loved that you included the beginning and the middle and the end result, all three phases in one. How I wish I had the energy to do this one. Keep up the wonderful hints and instructions. Thank you so much Kathie! Unrelated, we love the rug in that room. Do you by chance know the manufacturer/where you purchased it? Thank you! You can find the rug here – https://www.rugstudio.com/artistic-weavers-egypt-lara-teal-blue—silver-area-rug.aspx. It is beautiful and has held up pretty well but has gotten a few pulls in it so it isn’t quite as durable as some other rugs I have had. Good question! I am not an HVAC expert by any stretch but I would imagine you could put an attractive vent in the wood enclosing the top portion so the air could still circulate into the room. Or it might work even better to insert some cutout panels similar to what they used to used for radiator covers. They come in really pretty patterns and can be painted to blend in with the wall. Hi! I am looking to do this in my office and have a question about painting the trim boards… Did you paint all of the baseboard trim in the rest of the room the “ikea white” or just the trim on the built-ins, leaving the rest of the baseboards/trim alone? Love your tutorial – I’ve looked at MANY and yours is excellent! :) Thank you for sharing!! Erica, great question. I actually debated about this. The rest of the trim was already painted a bright white so I ended up painting just the trim around the built-ins the ‘IKEA white’ and leaving the other trim bright white. If you look closely, you can tell a difference where the two meet but nobody would notice if they weren’t staring closely. And I’m really glad you found my tutorial helpful- I tried to be as detailed as possible because I was frustrated after reading a lot of less helpful ones!